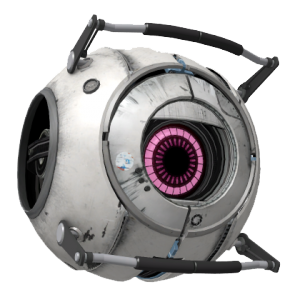 The Fact Sphere is a corrupted personality core that appears in the single-player campaign of Portal 2. Fact is one of the cores retrieved by GLaDOS for Chell to attach onto Wheatley, in order to initiate a core transfer procedure via corrupting his control of the central core body. The Fact Sphere speaks like a stereotypical "know-it-all", spending most of its time rapidly rattling off various facts. While a small portion of the listed facts are true, most of them are incorrect and downright illogical. The Fact Sphere, along with all the corrupted cores, is voiced by Nolan North. Fact Sphere was the only one out of three corrupted cores that managed to evade being sucked into space when Chell opened a portal to the moon. In the unused audio files, Fact Sphere can be heard yelling at both the Space Sphere and Rick. This could be used for three things: used when they are in the cage right before the boss fight begins, while on the central core body, or both it and Rick were going to be in the ending cutscene. This page was last modified on 27 March 2016, at 21:07.